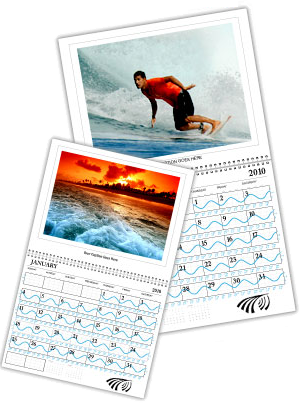 Our pre-printed, glossy tide calendars feature brilliant photographs of ocean scenes. The most popular feature of the calendar is it’s unique collection of wavy lines, called “sine waves,” that chart the rise and fall of the tides in a given area. The sine waves offers a graphic, easy-to-read alternative to typical numeric tide charts. Choose from one of 23 tide regions in the United States. Our easy to use software will enable you to customize your own calendar by uploading photos, entering captions and special dates. You may choose from 3500 tide locations nationwide. These personalized calendars make great holiday gifts!